Saranzaya is a Senior Lecturer in Management and Course Director of an undergraduate programme in Events and Entertainment Management. Saranzaya has a diverse background in both Academia and Industry, with expertise in cross-cultural management, human resources, and leadership practices in emerging countries. She teaches in the areas of event management, human resources, cross-cultural management, and research methodology. 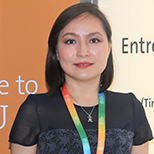 Prior to joining LSBU in 2013, Saranzaya worked as a Management Consultant and lecturer at colleges and universities in the United Kingdom and Mongolia. Saranzaya holds a BA (Hons) degree in International Relations from the National University of Mongolia, an MBA degree from University of Gloucestershire and a PhD in Management Studies from the University of Essex. Currently, she is doing her PG Diploma in Academic Practices from City University in London. Saranzaya’s research interests include socio-cultural and institutional aspects in management practices including the roles of informal networking, trust-building, and managerial responsibilities of managing in uncertain environments and building organisational resilience. Empirically, Saranzaya’s research focuses on transitional peripheries including Mongolia and Kazakhstan. She is a frequent speaker at international management conferences and Mongolia-focused investment and business events. Saranzaya has extensive experience in teaching international management subjects including cross-cultural management, human resources and event management. She is an expert in qualitative research methods including ethnography and participant observation. Saranzaya is an Associate Fellow of the Higher Education Academy (AFHEA). Saranzaya’s core areas of teaching are: Cross Cultural Management, Human Resource Management, Leadership, Events Management, Events Strategy, Logistics, Leisure Operations, Leisure and Consumption, Qualitative Research Methods, and BA and MA/MSc dissertation supervision. Saranzaya has a strong research interest in the field of management and her research focuses on cross-cultural management, HR, and leadership practices and institutional changes in transitional periphery. She completed her PhD on the topic of ‘An ethnographic investigation into Mongolian management in the context of cultural and institutional changes’ in 2017. She is a regular contributor on management and institutional changes in emerging countries including Mongolia, Kazakhstan and Russia. She writes on the topics of managerial roles, symbols in an organisational context and the relationship between culture and institutions in the case of Mongolia and other transitional trajectories. Saranzaya’s current research focuses on the socio-cultural and institutional aspects of management practices including the roles of informal networking, trust-building and managerial responsibilities of managing in uncertain environments and building organisational resilience. Empirically, Saranzaya’s research focuses on transitional peripheries including Mongolia and Kazakhstan. She has published academic papers and a chapter of a book from her current research agenda. Saranzaya presents her research at international management conferences including the annual BAM (British Academy of Management) and Ethnography Symposium conferences and other research seminars at the University of Cambridge, University of Bonn and University of Essex. Saranzaya collaborates with colleagues from reputable universities to co-write research articles and organise conferences. Manalsuren, S An ethnographic investigation into Mongolian management in the context of cultural and institutional changes. doctoral, University of Essex. Saranzaya is an Associate Fellow of the Higher Education Academy (AFHEA), a member of the British Academy of Management (BAM), Society for Research into Higher Education (SRHE), and Chartered Management Institute (CMI). She presents papers at both national and international conferences as well as facilitating workshops at the UK-Mongolian Business Chamber of Commerce event and Invest Mongolia Summits in Hong Kong, London and Mongolia. Saranzaya is a Board Member of the Mongolian Business Trade Council in the UK, and actively engages with high-profile business meetings, events and investment summits. She is also a member of Tsahim Urtuu NGO- a non-profit and non-political organisation, which promotes Mongolian-related scholarly activities and research. Saranzaya runs a Masterclass in ‘Cultural Intelligence’ with the Yurt Academy, a Brighton-based knowledge sharing initiative. Additionally, she works as an Independent Consultant for cultural awareness in business negotiations and managing human resources for companies which operate in Mongolia, or are considering doing so in the future.